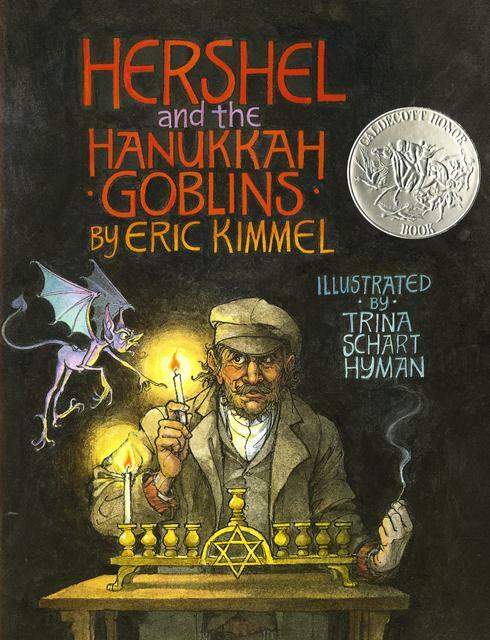 Expert Review of Hershel and the Hanukkah Goblins by Eric A. Kimmel, one of our picks of the top Jewish books for kids! What are the poor villagers to do? The holiday-hating, hill-dwelling hobgoblins are bound and determined to ruin yet another Hanukkah for them. Every year the beasties snuff out the menorah candles, destroy the dreidels, and pitch the potato latkes on the floor. But these wicked wet blankets never counted on someone as clever as Hershel of Ostropol showing up. Using his wits and a few props (pickles, eggs, and a dreidel)- Hershel manages to outwit all the creepy critters and break the spell. This creative adaptation of the ancient Hanukkah story - in which the Syrians outlawed many Jewish practices - keeps the spirit of the original while adding a spine-tingling twist. Warmth and humor prevail, even in the midst of hopeless-looking circumstances. Award-winning illustrator Trina Schart Hyman creates lively and witty pictures that pair perfectly with Eric Kimmel's words to create this Caldecott Honor Book.